How to understand the forest of Agile methods, and frameworks? How can we see the wood for the trees? At this moment I am aware of several different methods and frameworks with a link to Agile. In the attached pictures you already see several of them, like Agile PM, Agile PgM, DevOps, Disciplined Agile 2.0, DevOps, Feature Driven Development (FDD), Kanban, PRINCE2 Agile, Large Scale Scrum (LeSS), SAFe 3.0 / 4.0, The Scrum Guide, The Nexus guide, Test Driven Development (TDD), eXtreme Programming (XP 2.0). In the picture I didn’t include Kanban, Lean Start-up, but you can find overviews on my blog. Roles & responsibilities: includes the steering roles Business Sponsor, Business Visionary, Technical Coordinator and Project Manager. The Solution Development Team is formed by the Team Manager, the Business Ambassador, the Business Analyst, Solution Developer and Tester. AgilePgM is developed by DSDM. AgilePgM consists of four elements: philosophy, five principles, six processes and six themes. Philosophy: An agile programme delivers what is required when it is required – no more no less. The six processes are Pre-Programme, Programme Feasibility, Programme Foundations, Capability Evolution, Tranche Review and Programme Close. The themes or knowledge areas are related to Roles, Governance, Stakeholder engagement, communication and management, Planning, Management and control and Quality Management. Is an enterprise wide scalable process framework (people first, learning oriented hybrid agile approach to IT solution delivery). Enables agile delivery teams to succeed (work together with people outside the team). Provide a coherent strategy for agile IT (different BoKs at different points on the agile/lean learning curve). Supports the lean enterprise (IT is able to work in an agile/lean manner and the context counts (tailor). FDD is a model-driven short-iteration process that consists of five basic activities: Develop overall model, Build feature list, Plan by feature, Design by feature, Build by feature. Kanban is a scheduling system for lean and just-in-time production. When there is no explicit limit to the work in progress (WIP, or the maximum number of cards at a specific process step) and there is no mechanism to show that we have to pull new work into the system, it is not a Kanban system. Use models to recognize improvement opportunities. Large-Scale Scrum is Scrum. There is only One Product Backlog, one Product Owner, one potentially shippable product increment, and one Sprint. LeSS was developed (starting in 2005) to apply Scrum to very large and multisite product developments. Today, the two LeSS frameworks (basic LeSS and LeSS Huge) have been adopted in big product groups worldwide. Principles: empirical process control, transparency, more with less, whole-product focus, customer-centric, continuous improvement towards perfection, systems thinking, lean thinking, and queuing theory. Is a method for developing businesses and products. Within the philosophy of embracing change, PRINCE2 Agile also introduces the principle of lean start-up. Lean start-up focuses on validated learning and act accordingly. Try as fast as possible (fail fast). But take as soon as possible (parts of) products in use, and learn from them. The product that processed most of the learning experiences, usually delivers the most value. MVP: (not necessarily the smallest product imaginable): Concierge, Smoke test, Video, Split test, Early prototype. The existing PRINCE2 principles, processes and themes remain, but should be tailored using the agile way of working and the project itself. PRINCE2 Agile searches for the best of both worlds where the emphasis lies in the use of PRINCE2 within project direction and project management and the agile approach in the product delivery. SAFe 4.0 is a framework for using agile and lean practices at organization wide scale (Software delivery focus). Portfolio: portfolio backlog, business and enabler epic-level decisions. To align value streams with the business strategy. Value stream: optional, intended for complex environments where multiple agile release trains exist. Programme: to deliver programme increments, coordination of a number of agile teams with there release trains based on a programme backlog. Team: foundational layer of SAFe, and powers the agile release train. Can make use of Scrum, XP, Kanban, etc. Nexus is developed by Ken Schwaber and is his answer on developments with more than one scrum team. It starts with one Product Owner managing the Product Backlog. The Product Owner sets up the Nexus Integration Team. In this team we see Integration Team members as well as a Scrum Master. The Nexus Integration Team together with representatives of the Scrum teams develop the Nexus Sprint Backlog (Nexus Sprint Planning.). Each Scrum Team will have its own expertise area and have its own Development Team members and a Scrum Master. Every day the Nexus Integration Team and representatives from the Scrum Teams will have their Nexus Daily Scrum to discuss integration issues, dependencies and sharing information across the teams. Joined to this Nexus Daily Scrum the individual Scrum Teams will have their own Daily Scrums. The Scrum Teams will develop their parts and integrate and test their work with that of the other teams. At the end of the sprint we have the Nexus Sprint Review demonstrating, showing the Integrated Increment. This is a joined review with all team and replaces the individual Scrum Team Reviews. An overall Nexus Sprint Retrospective focusses on inspection and adaption and consists of three parts: The first part is identification of issues impacting more than one Scrum Team. Part two are the individual Scrum Team Retrospectives and the last part focusses on actions to be taken. Scrum is developed by Jeff Sutherland and Ken Schwaber. Artifacts: Product Backlog, Sprint Backlog, Increment. XP is a software development methodology and is created by Kent Beck focussing on delivering quality. It contains several planning and feedback loops: code, pair programming, unit test, pair negotiation, stand up meeting, acceptance test, iteration test, release plan. Practices: Fine-scale feedback, Continuous process, Shared understanding, Programmer welfare, Coding, Testing. Please let me know if you are aware of other interesting agile methods/frameworks. Wednesday Jan 6th, I gave a presentation regarding PRINCE2 Agile for the BPUG. You can find the presentation on the BPUG site. I would say a lively session with lots of positive and enthusiastic reactions. I started with a short visual movie created by Kirsten Casper from Hedeman Consulting. In the second part of this session we focussed on the Agilometer. In the attached figure you see the three management levels and the Agilometer. The Agilometer will help to understand how far the agile thinking can rise up or how far the PRINCE2 thinking can cascade down. When a suitability slider, e.g. “Flexibility on what is delivered” is moved to the right (becomes completely yellow) we have a project where agile thinking is maximized. At the opposite side (slider to the left (completely blue) the PRINCE2 thinking is completely cascaded down. The official manual only describes the full agile situation. In this situation the sliders are all moved to the right. In 12 groups we discussed the definition and example behaviour of the missing situations. Due to time constraints we focussed on the left side, the traditional approach and the middle where parts from the traditional PRINCE2 as well as the agile world are equally combined. ‪I added all your comments in the 6 slides and with great help from Richard Metcalf (one of the attendees) these were translated in understandable sentences. Feel free to comment on the results till so far. ‪As a next step I will generate a final version using your feedback and other material such as the questionnaires from KWD Resultaatmanagement (Agile Geschikt/Ongeschikt) and the Project Approach Questionnaire from AgilePM. De nieuwe geheel herziene druk van ons boek is beschikbaar! Het boek Managen van agile projecten 2de geheel herziene druk is gebaseerd op Agile Projectmanagement Handbook Version 2 van DSDM en vervangt daarmee de 1ste druk die gebaseerd was op DSDM/Atern versie 2 en het Agile Project Management Handbook Version 1.2 van APMG. Dit boek is geschreven voor de Projectmanager die leidinggeeft of gaat geven aan agile projecten. Het is echter geen rechtstreekse vertaling van het DSDM handboek. Op onderdelen geeft het boek een eigen visie op het managen van agile projecten. Verder is getracht de methode meer toegankelijk te maken voor de lezer. Het boek is onderverdeeld in een viertal delen. In deel I. Methodiek worden de uitgangspunten, het raamwerk, de filosofie, de principes en de succesfactoren van AgilePM beschreven. Verder worden in dit deel de AgilePM-rollen, -processen en -producten beschreven. In deel II. Projectmanagement wordt nader ingegaan op de consequenties van de AgilePM-aanpak voor de verschillende aspecten van projectmanagement. In deel III. Technieken worden de afzonderlijke technieken beschreven die in agile projecten worden toegepast om ervoor te zorgen dat de filosofie en uitgangspunten van AgilePM in projecten ook daadwerkelijk worden ingevuld. In deel IV. Afstemming wordt ingegaan op de vraag hoe de verschillende methoden zich tot elkaar verhouden. AgilePM en PRINCE2 worden met elkaar vergeleken. Scrum, Lean Six Sigma, continue oplevering, DevOps-teams, Kanban en PRINCE2 Agile worden nader toegelicht. Verder wordt aangegeven hoe de verschillende methoden zijn te combineren en hoe een compleet portfolio van projecten met verschillende methoden het best kan worden gemanaged. Dit boek is een geschikte basis om zich voor te bereiden op het examen AgilePM Foundation en Practitioner. De AgilePM-methode voor het managen van agile projecten bestaat uit een raamwerk, omvattende een filosofie, daarvan afgeleide principes en een viertal bouwstenen. De AgilePM-filosofie is dat ieder project moet worden afgestemd op duidelijk gedefinieerde bedrijfsdoelen en moet focussen op een vroege oplevering van producten die echt toegevoegde waarde leveren aan de bedrijfsorganisatie. AgilePM kent een achttal principes. Agile in meer algemene zin kent meer principes die hier bovendien iets van afwijken. De agile principes zijn met name gericht op het zelf-organiserende team. De AgilePM-principes zijn meer gericht op het project als geheel. Belangrijke technieken zijn met name timeboxen, planning poker, gefaciliteerde workshop en prioritering van functies op basis van het MoSCoW-principe. In de Pre-projectfase wordt besloten het project uit te voeren. In de Haalbaarheidsfase wordt nagegaan of het project vanuit zowel zakelijk als technisch oogpunt realiseerbaar en wenselijk is. In de Fundatiefase wordt, zoals de naam zegt, de fundering gelegd voor de uitvoering van het project. Na de Fundatie start de uitvoering van het project. Dat gebeurt in vooraf gedefinieerde increments. Per increment wordt een werkend deel van het eindresultaat opgeleverd. Ieder increment bevat in principe de fasen Ontwikkeling en Ingebruikname. Na de Implementatie wordt een nieuw increment opgestart of het project afgesloten mocht aan de eisen zijn voldaan. In de Post-projectfase wordt nagegaan of de geprognotiseerde baten ook daadwerkelijk zijn of worden gerealiseerd. AgilePM maakt onderscheidt tussen de projectbesturing, het Ontwikkelteam en overige rollen (zie figuur 2). De projectbesturing wordt gevormd door de Bedrijfssponsor zijnde de opdrachtgever, de Bedrijfsvisionair zijnde de vertegenwoordiger van de gebruiker op managementniveau, de Technisch Coördinator zijnde de vertegenwoordiger van degene die het resultaat moeten opleveren en de Projectmanager, verantwoordelijk voor de coördinatie en communicatie. Het Ontwikkelteam wordt gevormd door de Teammanager, de Bedrijfsambassadeur, de Bedrijfsanalist, de Ontwikkelaar en de Tester. Essentieel binnen AgilePM is dat er sprake is van een zelf organiserend team. De Teammanager moet ervoor zorgen dat het Ontwikkelteam ook echt als team functioneert. De Teammanager is in deze echter meer faciliterend en begeleidend dan manager. De Bedrijfsanalist vertaalt de bedrijfseisen naar technische oplossingen De Bedrijfsambassadeur is verantwoordelijk voor het detailleren en prioriteren van de gebruikerseisen en voor het (laten) testen van de gerealiseerde producten vanuit gebruikersperspectief. De overige rollen binnen de AgilePM-structuur zijn de Bedrijfsadviseur, de Technisch Adviseur, de Workshop Moderator en de agile coach. De Bedrijfsadviseur is vaak een collega van de Bedrijfsambassadeur en levert specialistische input. Datzelfde geldt voor de Technisch Adviseur maar dan alleen vanuit het leveranciersperspectief. Dit is een interessant boek voor iedereen die benieuwd is naar het managen van agile projecten en meer wilt weten dan alleen scrum. Het is enerzijds geschreven voor personen die zich willen voorbereiden op het AgilePM Foundation en Practitioner examen en anderzijds voor mensen die naast AgilePM zelf ook de relatie van AgilePM met andere agile methoden en raamwerken willen begrijpen. 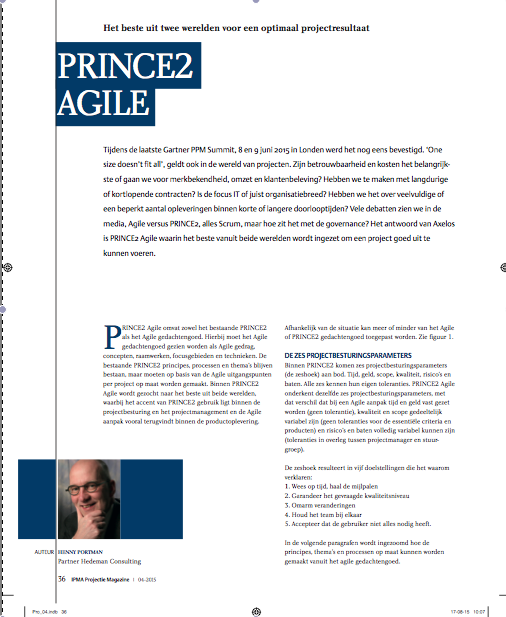 Zie ook mijn (Engelstalige) posts over PRINCE2 Agile waarin facetten uit PRINCE2 Agile worden beschreven zoals Lean Startup, Kanban etc.